The Last Stronghold of the Pure Gospel: An-Diugh. So we're in a B&B on the Isle of Skye a few weeks ago, and I'm flipping through the TV channels, trying to find something that will trick my jet lag into letting me sleep. All of a sudden, this angelic music starts pouring out of the box. Now, I'm not a religious guy, but these spiritual songs were mesmerizing. The whole show was in Gaelic, with English subtitles, on a BBC channel called Alba, which is the Gaelic name for Scotland. This 50-minute documentary, an episode of a series called "Everyman," was entitled "The Last Stronghold of the Pure Gospel: An-Diugh" and was apparently shot in 1979 by Michael Radford, before he got famous and started winning awards. It profiles the Scottish islanders on the Isle of Lewis in the Outer Hebrides who believe in the literal truth of the Bible. The episode now includes an update on what happened to some of those featured in the original program. And the tunes knocked my socks off. Later: if you're in the UK, I think you can watch it here. Still later: Isle of Lewis, Callanish Stones. 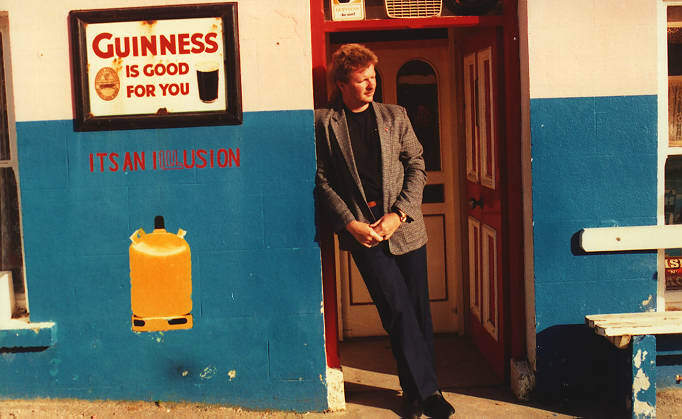 Summer of 1991, Ring of Kerry, Dingle Peninsula: behold a typical scene in an ambitious campaign to infiltrate the secret pub culture of western Ireland (native rituals dictate inhaling vast quantities of a thick brownish health shake). In the Gaeltacht, we find our hero reeling from the doorway of a local establishment, out like a carp.